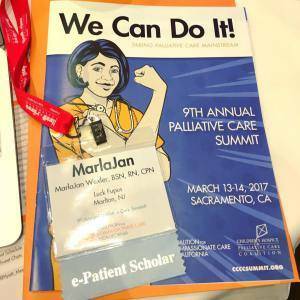 I attended the Coalition for Compassionate Care of California Conference (#CCCC17) in Sacramento this week as an ePatient Scholar. Exhilarating, informative, warm, curious, inspiring, and tiring. I hoped to leave with one novel (for me) insight into palliative care; hear patient, caregiver, and clinician stories about their experiences; to hear how clinicians receive education about end-of-life conversations; to add to my network of patient/caregiver experts; and leave with a sharper focus for my #careplanning work. Amazing! I accomplished all five. I hoped to accomplish three of five (I habitually set myself up to exceed expectations). The new insight: In Prognosticating for Adverse Outcomes Using Palliative Care with Daniel Hoefer, MD, I learned that we can predict probable outcomes for elderly persons with few reserves facing surgery and hospitalization. They will be likely to have cognitive and functional decline and go into a nursing home. The hip replacement may be successful but without an acceptable quality of life. Intriguing presentation. Personal stories of individuals, caregivers, and clinicians filled every nook. Two twenty-somethings, Charlie and Devon, spoke about their experience with serious chronic illnesses since birth. One had just had the first full year of unhospitalized life in her 26 years. Danielle, a caregiving mother, shared stories about her 10-year-old daughter’s journey born with one ventricle. Surgery after surgery, complication after complication, traveling back and forth from Arizona and Boston for care. Sandy Chen Stokes, RN, MSN received an award for her work with the Chinese American community. This community has the lowest rate of hospice use of any group in the US. The Chines American Coalition for Compassionate Care represents 1300 people in 80 groups around the country. A force of nature! I wish I had a means of recording these stories and sharing them. I’ll be collaborating with the Patient Voice Institute to make this easier. I spoke with Michael Fratkin, MD, Director, Resolution Care, about a virtual immersive learning tool being developed by Lahey Clinic and Wellesley Partners to teach physicians to be more skilled at advanced care planning. He advised me that the support of clinical leadership, alignment with daily clinic workflow, and interest of the physicians were needed for any teaching tool to be effective. Finally, I received reinforcement from my ePatient mates to focus some of my work on tools for goal setting and measurement of goal concordant care (Our care follows our preferences). This week I’m headed to DC to complete review of PCORI Palliative Care funding requests. Onward! thanks Danny. This speaks to me and moves me so much.